Growth/differentiation factor-15 (GDF-15) is a distant member of the transforming growth factor-β superfamily and is ubiquitously expressed in the central nervous system. It is prominently upregulated in cerebral cortical and ischemic lesion paradigms. GDF-15 robustly promotes the survival of lesioned nigrostriatal dopaminergic neurons in vivo; GDF-15-deficient mice exhibit progressive postnatal motor and sensory neuron losses implying essential functions of GDF-15 in neuronal survival. We show that GDF-15 mRNA and protein are, respectively, six-fold and three-fold upregulated in the murine retina at 1 day after optic nerve crush, slightly elevated mRNA levels being maintained until day 28. However, the magnitude and time course of retinal ganglion cell (RGC) death are indistinguishable in knockout and control mice. Selected mRNAs implicated in the regulation of the death vs. survival of RGCs, including ATF3, Bad, Bcl-2 and caspase-8, were similarly regulated in both knockout and control retinae. Immunohistochemistry for tyrosine hydroxylase and choline acetyltransferase revealed no differences in staining patterns in the two genotypes. 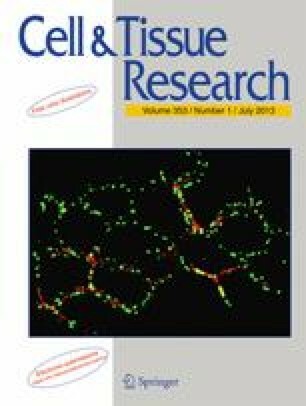 mRNA and protein levels of galanin, a putative neuroprotective factor and positive regulator of neuron survival and axonal regeneration, were prominently upregulated after crush in knockout retinae at day 3, as compared with control retinae, suggesting that GDF-15 acts as a physiological regulator of galanin. GDF-15 is therefore prominently upregulated in the retina after optic nerve crush but does not directly interfere with the magnitude and temporal progression of RGC death. Petar Charalambous and Xiaolong Wang contributed equally to this work. We thank the German Research Foundation (DFG) for supporting our research on GDF-15. We thank Ioannis Patrozos, Attila Magyar and Katrin Huber-Wittmer for support and constructive discussion.